Charles and Di got married in a fairytale wedding at St Paul's Cathedral. Charles and Diana were officially divorced. Prince Charles, Prince of Wales and Diana, Princess of Wales leave St. Pauls Cathedral. Prince Charles, Prince of Wales and Diana, Princess of Wales in their wedding carriage. Britain's Prince Charles and Princess Diana, centre, stand with other members of the British Royal family for a photograph at Buckingham Palace. Queen Elizabeth II and Earl Spencer leave St. Paul's Cathedral after the wedding of Prince Charles and Lady Diana Spencer. Prince Charles, Prince of Wales and Diana, Princess of Wales leave St. Pauls Cathedral in London following their wedding ceremony. Diana, Princess of Wales is led down the aisle of St. Paul's Cathedral by her proud father, Earl Spencer, on her wedding to Prince Charles, Prince of Wales on 29 July 1981. The Princess of Wales seated in her bridal gown at Buckingham Palace after her marriage to Prince Charles at St. Paul's Cathedral. Earl Spencer (right) accompanies his daughter Lady Diana Spencer at her wedding to the Prince of Wales at St Paul's Cathedral. The official entry in the St. Paul's Cathedral Marriage Register, signed by Lady Diana Spencer (now the Princess of Wales) and the Prince of Wales. Earl Spencer leads his daughter, Lady Diana Spencer, down the aisle in St Paul's Cathedral, for her wedding to the Prince of Wales. * 29/7/81 of Earl Spencer leading his daughter Lady Diana Spencer down the aisle of St Paul's Cathedral for her wedding to the Prince of Wales. Lady Diana Spencer with her father Earl Spencer on their way to St. Pauls Cathedral in the City of London, for her marriage to The Prince of Wales. The newly married Prince and Princess of Wales (formerly Lady Diana Spencer) kiss on the balcony of Buckingham Palace after their wedding ceremony at St. Paul's cathedral. The Duke of Edinburgh, father of the Prince of Wales, with Mrs Shand Kydd, the mother of Lady Diana Spencer, on their way to St. Pauls Catherdral to attend the wedding of their children. Reverend Harry Williams reads the final prayer facing the Prince and Princess of Wales before the altar during their marriage ceremony as St. Paul's Cathedral. The Prince and Princess of Wales on the balcony of Buckingham Palace. 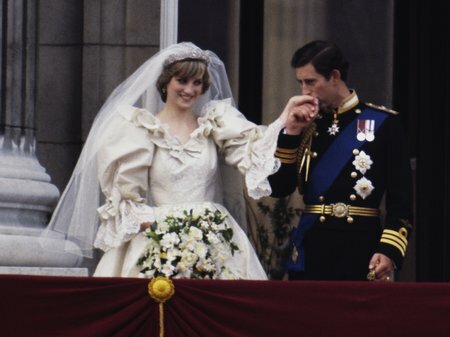 The Prince of Wales and his bride, the Princess of Wales, make their way to Buckingham Palace in an open-top carriage after their wedding ceremony at St. Paul's Cathedral. Crowds of patient tourists got themselves front row viewing positions around the Queen Victoria Memorial in front of Buckingham Palace for the Royal Wedding procession and pageantry. The Prince & Princess of Wales (c) and their young attendants. (Sitting L-R) Catherine Cameron & Clementine Hambro. (Standing L-R) Lord Nicholas Windsor, Edward Van Cutsem, Sarah Jane Caseless (in front of) India Hicks, Prince Edward, Prince Andrew & Lady Sarah Armstrong. Crowds lining the Royal Wedding route applaud as they got a close-up view of the precision marching and colorful pageantry during the procession to and from St. Paul's Cathedral. The Prince and Princess of Wales at Buckingham Palace after their wedding at St Paul's Cathedral. The official Royal Wedding cake, 5ft high and weighing 255 lbs, made by the Royal Navy's Cookery school, HMS Pembroke, at Chatham, which was delivered to Buckingham Palace.